Retro Tales Issue 1 - it's HERE!!! Yours truly is going to be a guest at this weekend's Cardiff Film and Comic Con at the Motorpoint Arena... where I will be very proud to debut the fantastic first issue of RETRO TALES! Yes, it's finally happening! Prepare to meet the world's Funkiest Superheroes, as only the House of no ideas can bring you! 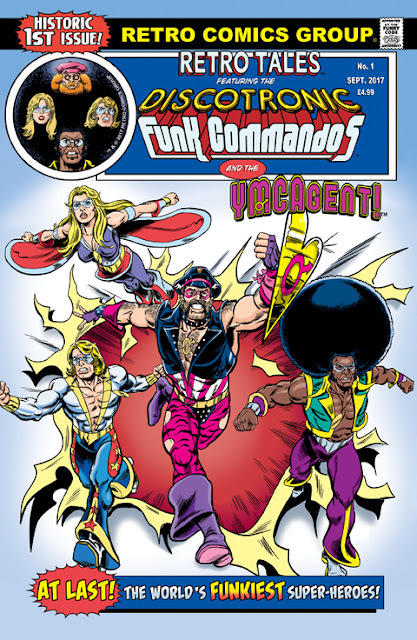 Super-Trouper, Dancing Queen, Afro-Man and Randy Hogan - the DISCOTRONIC FUNK COMMANDOS! Yes, 21 years in the making, and the Funk Commandos finally make their dynamic debut! Plus - making his first ever appearance in action, the legendary Knight in Pink Satin... the YMCAGENT! Yes, the Camp Crusader is also making his flamboyant debut, and has already proved to be a hit with fans who have seen him online! Be sure to pick up your copy this weekend... and for those of you who can't make the sure, worry not. Your Sizzling artist is working feverishly here at Stately Soul Manor on ways to make it available to you all! Watch this space for more news! ™ & © 2017 Simon Williams.